Ray Stakenas, the unannoited champion-in-waiting. goes up against former champ Bill Edwards in the prelims. Life is tough in Up Front land. 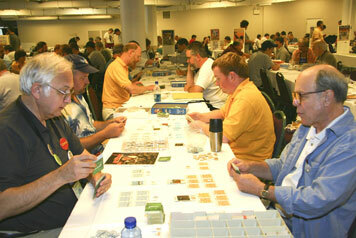 Two former champs vie for another title as Bruce Young (left) and Herbert Gratz renew old rivalries. Herbert took his first UPF laurels this year because his championship preceded the advent of WBC laurels and he has been playing World at War in the interim. 27 players, an alltime low for this event which has been slowly but surely reducing the field to increasingly grizzled sharks, reported for Up Front. duty. Six new players were present and willing to be schooled by six former champions representing twelve plaques who had returned for the annual slugfest. While last year's winner, Paul Wright, could not be present due to book research in Italy, it was plain that most other recent winners were anxious to carve another notch in their BARs (Boardgame Achievement Results). Five Swiss Rounds and tie breakers would promote the best squad leaders up front to an eight-man single elimination gauntlet.. The perception of Up Front is that it is a game heavily driven by the luck of the draw. 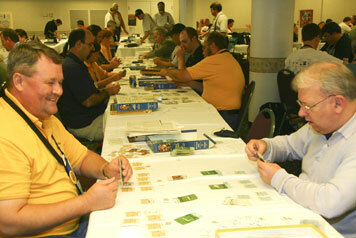 Getting good cards is seen as more important than skill by many neophytes. The results of the WBC tournament would seem to belie that notion. There were 32 games played between former winners and the rest of the field during the tournament. 29 of those games resulted in wins for the champions - an amazing result, made even moreso when we note that last year's runner-up and perennial contender Ray Stakenas was responsible for two of the three "upsets". If we deduct unannoited Ray's two games and assume that the game is even save for the luck of the draw, the odds of our former champions winning all but one of 30 games is about 30,000.000-1. Maybe there is more to this game than mere luck. At any rate, the final field of eight contained five former champions ready to fight it out in the single elimination gauntlet. After the first round, four former champions Bruce Young, Herbert Gratz, John Emery, and Ray Stakenas II were still around for the semis. Even though Bruce and Herbert were not able to prevail, they still provided the audience with good games and then agreed to fight to the finish for third place. In a close game using Scenario L (a particular favorite in the elimination rounds), The US attackers of Gratz were able to overcome Young's German defenders for the podium position. In the Final, the players also selected the Outpost Line scenario with John choosing the Germans as Attackers against Ray's Russian Defense. Ray was able to get better work out of his radio and hold off John's assault with artillery fire. When the SPW 251 failed to perform in the assault, the German's fate was sealed. Ray was able to cause too many casualties for John to continue and joined the ranks of multiple champions with his second plaque. John improved from last year's third to second and still retains the overall lead with five shields. Ray was also able to shame his teammates as this was his team game. 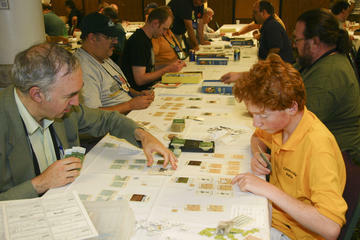 Two Brits come to the US to play Up Front, Nicky Palmer, who wrote his "An Introduction to Wargaming" before William Kendrick was born, schools young William who is playing - naturally - the Brits and appears to be a member of the Greenville Mafia's British chapter. 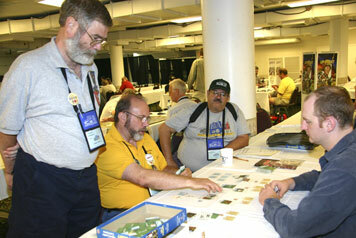 GM Jim Burnett observes his finalists in their Round 8 battle of champions as Alan Arvold watches in the background.